Clean, localized, fresh looking PDF invoices for you and your customers. 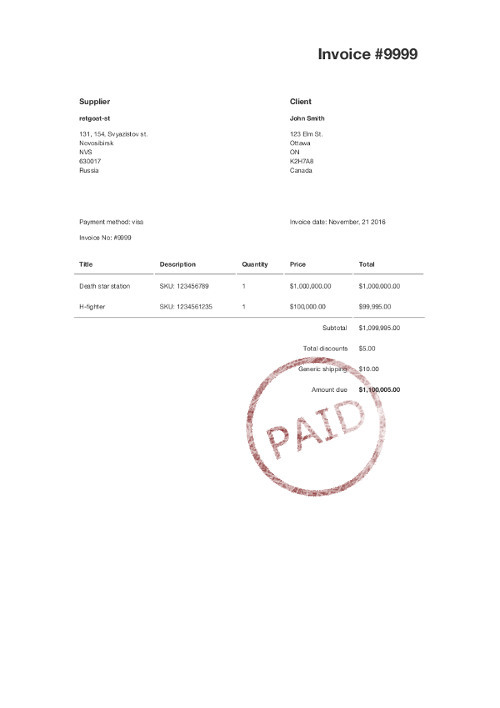 Fully customizable invoice sending: order created, order paid, order fullfilled. You can send as many invoices as you need. No limits. Basic plan for small shops. For medium business. All features from Starter plan and more! For large business. All features from Starter and Basic and some king additions. Very helpful customer service. The app works fine and problems are sent automatically to the developer and will be solved with 2 days. Extra functions are easy to install and very usable. Visit Shopify AppStore to get it!